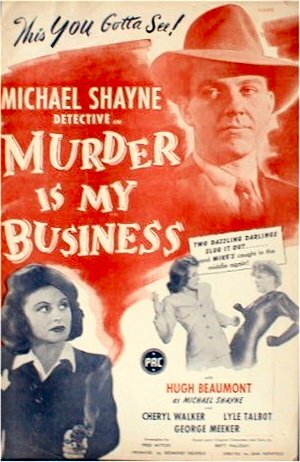 Four years after the 20th Century Fox run of Mike Shayne Movies, PRC revived the character in a series of their own. It consisted of five films and starred Hugh Beaumont as the famous gumshoe. The first four were directed by Sam Newfield and the last by William Beaudine.Beaumont played the character in a somewhat different style than Llloyd Nolan in the Fox films. These were fast paced and well moving from PRC. Reportedly they were based on stories by Brett Haliday, Shayne's creator.